Raising the Dead is a memoir of sorts, chronicling a Florida cardiologist's journey into the world of faith healing, the power of prayer, and divine intervention. After his own son is diagnosed with leukemia, the doctor and his wife do everything possible to get God on their side. Assisting a Mexican missionary, weekly flights across country to meet with the best doctors, and even a little pandering to the world's most well known televangelists---nothing is spared in the fight to find a cure. Too bad most of us poor folk don't have the funds to take last minute flights, buy and rent several homes at once, and convince famous nuns and other religious celebrities to meet with us personally. 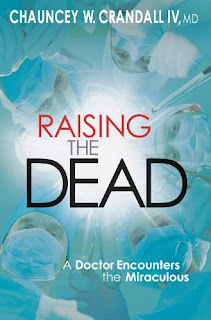 Plunging head first into all this prayer and divine healing, the good doctor starts doing a little laying of the hands and praying over people at revivals himself. He feels he's so good at this, that he plays around with the idea of abandoning being a doctor and doing this full time. God tells him he gave him his off-shore medical degree for a reason and that he's in the perfect spot to save those who would normally not be saved through other means. So, he starts praying for and with his clients until the story culminates with him saving the life of a heart attack patient who had been declared dead for over half an hour. Aside from the overtly radical Christian ideals, such as the devil being let in through an African fertility statue and watching Peter Pan, I found parts of this book to be absolutely appalling. There are so many statements, NON-religious statements, that this doctor makes that would lead me to NEVER put myself or someone I loved under his care. For starters, his "Yale education" is not exactly what it appears. After being rejected several times for medical school, Dr. Crandall ends up going down to a program in Granada, and only doing some of his clinicals at Yale, basically after (for the second time) playing the "we white English boys gotta stick together card." He also discusses how burdensome it is for him to be on-call for his hospital's emergency room, and doesn't even bother to hurry anymore when getting a code blue, taking his time and hoping that things are resolved by the time he gets there. Oh, and let's not forget about the time while serving with a missionary group that he had to be begged and coerced after refusing to administer aid to a fellow missionary who was involved in an accident. I was also confused as to why he felt the need to point out how he liked to minister in a fancy suit, yet sit among the "dirty, smelly, cripples" in the back. Why feel the need to distance yourself, to create that barrier, yet claim to tear that same barrier down? To me, that sounds like he was trying to raise himself up as superior in their eyes, make himself god-like, which even as an atheist, I know is spoken against in the Ten Commandments. I honestly wanted to really like this book, and in all fairness, the story itself is not a bad one. It was a quick, easy read that WILL leave you feeling SOMETHING. I don't disbelieve in the power of prayer and divine healing, but its a topic that I want to learn more about from a scientific perspective. However, even by trying to put my preconceived notions aside and look at things objectively, the over-the-top radicalized Christianity and the cocky, pompous doctor just turned my stomach. That's why I only gave it two stars. But, that's just THIS heathen's opinion. The book has raving reviews on Goodreads, with many people giving it at least a 4 star rating. If the topic is of interest to you, give it a look and let me know what YOU thought of it!